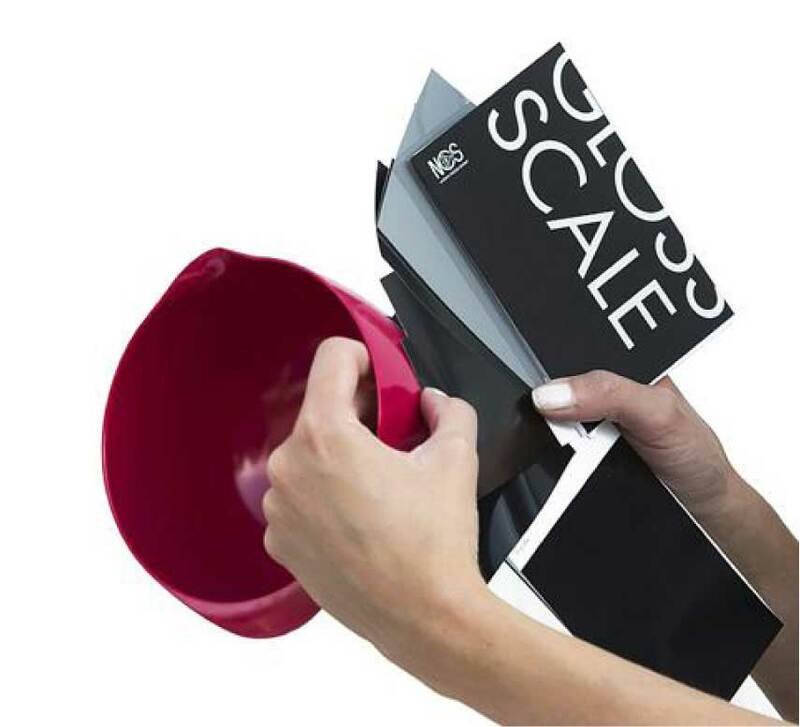 TheNCS Gloss Scale is compiled in a fan deck in small format 100 x 140mm where the colour samples can be fanned out, isolated from other colours and gloss levels and placed against different surfaces. Four colours from the greyscale are included, based on the lightness distribution in the NCS Colour Space. The colours are white, light grey, medium grey and black. For each colour area, seven gloss levels are given, ranging from full matt to high gloss. Each sample has information on the name of the gloss level, the colour sample's gloss value, NCS Notation and the colour sample's approximate lightness values, which in turn facilitate selection and comparison of a chromatic colour. 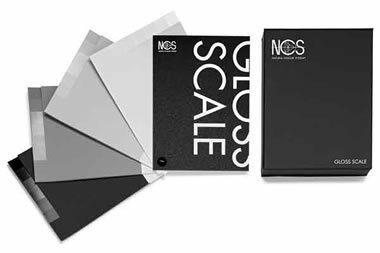 The NCS Gloss Scale is compiled in a fan deck in small format 100 x 140mm where the colour samples can be fanned out, isolated from other colours and gloss levels and placed against different surfaces. Four colours from the greyscale are included, based on the lightness distribution in the NCS Colour Space. The colours are white, light grey, medium grey and black. For each colour area, seven gloss levels are given, ranging from full matt to high gloss. Each sample has information on the name of the gloss level, the colour sample's gloss value, NCS Notation and the colour sample's approximate lightness values, which in turn facilitate selection and comparison of a chromatic colour. A small white cloth is included to help keep the gloss samples clean from fingerprints and dust particles, which are highly visible on glossy surfaces. It is sufficient to sweep lightly over the samples without rubbing. In order to preserve the surface on all matt samples, do not rub them with the cloth. Samples: Full Matt (gloss level 2), Matt (gloss level 6), Semi-Matt (gloss level 12), Satin Matt (gloss level 30), Semi-Gloss (gloss level 50), Glossy (gloss level 75) and High Gloss (gloss level 95). Specular gloss, measured according to ISO 2813, 60°. Print Layout: Fully Coated, Gloss name, NCS Notation, gloss level and lightness data printed beneath the colour sample. Package: Front cover in white PVC plastic 0.7mm; Reverse cover in white PVC plastic 0.7mm; placed in a black box. Shipping: Cardboard outer carton. Production: controlled by NCS Quality Centre, based on NCS Quality Management, in compliance with our ISO 9001 certificate. Go to NCS Product Guide for details on other NCS products.